Alex M. Brucker is the co-founder of Brucker & Morra, a professional corporation, and ERISA Law Firm located in Los Angeles, California. Alex is a nationally recognized ERISA and employee benefits attorney, lecturer and author. He has been honored in “Super Lawyers” and in “Best Lawyers in America” for more than 10 consecutive years. In 2017, Alex was named Best ERISA Lawyer – Los Angeles. 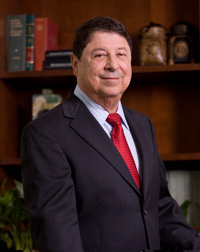 Alex began his career in benefits law in 1974, the year the ERISA law was enacted. His legal career grew with the law — a claim few attorneys in his field can make. He has since grown to be a tireless advocate for tax equity, particularly for privately owned businesses and business owners, and has worked with Congress on pension and tax legislation. Alex acts as counsel and co-counsel in ERISA and tax litigation and is often engaged as an expert witness in ERISA and retirement and welfare plan cases in both Federal and State Courts. Alex has recognized and respected relations with local and national professionals at the Internal Revenue Service, the Department of Labor and the Pension Benefit Guaranty Corporation. Alex is a Fellow of the American College of Employee Benefits Counsel. Alex is also a Director and Officer of the Small Business Council of America, Washington, D.C. (SBCA), a legislative advocate representing the interests of America’s small businesses and their owners. In 2009, Alex was honored with a Congressional Award for his outstanding leadership, dedication and achievement on behalf of the Small Business Council of America. From 2008 through 2010, on behalf of the SBCA, Alex actively worked with the Senate Finance Committee – Senators Max Baucus, Charles Grassley and Orrin Hatch, and House Ways and Means Committee – Representatives John Lewis and Charles Boustany Jr., to obtain needed relief from disproportionate IRS penalties. The results of his efforts were enacted into the Small Business Jobs and Credit Act of 2010, for which he received the SBCA Special Appreciation Award. He has lectured before the Annual Enrolled Actuaries Conference, American Society of Pension Professionals and Actuaries, University of Southern California Federal Tax Institute, California CPA Foundation for Education Conferences, State and Local Bar Associations National Institute of Pension Administrators,Western Pension and Benefits Conference, International Foundation of Employee Benefit Plans,speaking on such issues as ERISA fiduciary obligations, investing and liabilities, ERISA Litigation, IRS and Department of Labor investigations, audits, controversies and correction initiatives. Alex has led continuing education pension and employee benefits workshops for attorneys, plan administrators, trustees, accountants, and insurance and financial professionals. His knowledge of the intricacies of the regulations and policies of the Internal Revenue Service and the Department of Labor, results in exceptional insight, experience, credibility, authority—and creative solutions—for his clients.